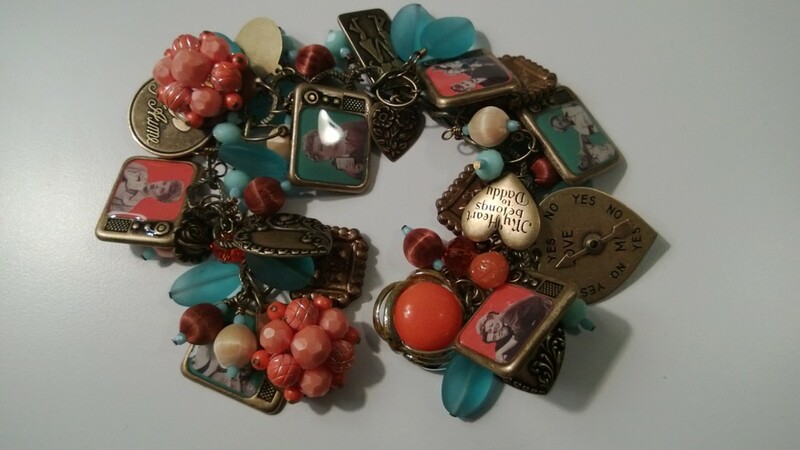 I Love Lucy convertible charm bracelet. Wear it as a bracelet OR clip on the handy little extender and boom! you have an instant necklace and conversation piece! Want to participate in the Tangerine, Aqua and Chocolate Challenge? Join B'Sue Boutiques Creative Group on Facebook and get in on the fun! Tagged with chunky charm bracelets, charm bracelets, Vintage Jewelry, Small Stuff Design. January 13, 2013 by Renee Allen. B'Sue Boutique Creative Group on Facebook's January Challenge is a color story of Tangerine, Aqua and Chocolate. 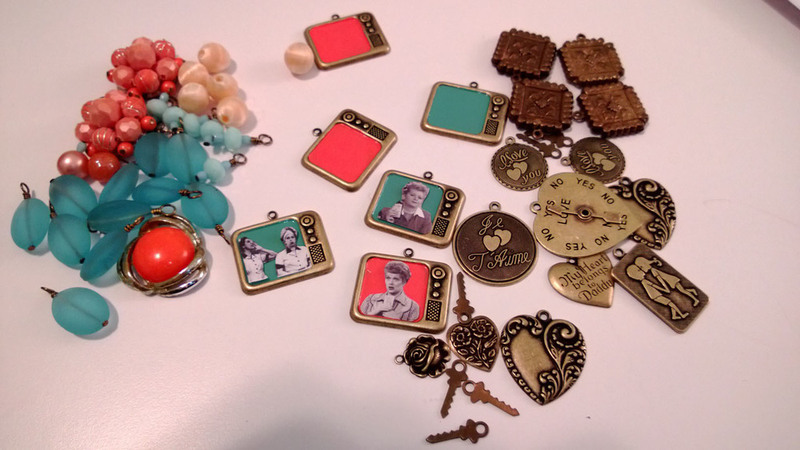 That color combination screams "retro" to me, so I broke out some adorable vintage-looking TV charms. They are perfect for little resin pendants and what better images to put in the old fashioned TV than the iconic I Love Lucy? I'm addicted to playing with nail polish and resin in bezels, so I was off to my neighborhood Walgreens for the perfect shades of orange and blue to coat my little teevees. Next came rummaging through the workroom for beads, old and broken jewelry and charms. These are two of my favorite colors, so this was pretty easy to accomplish. 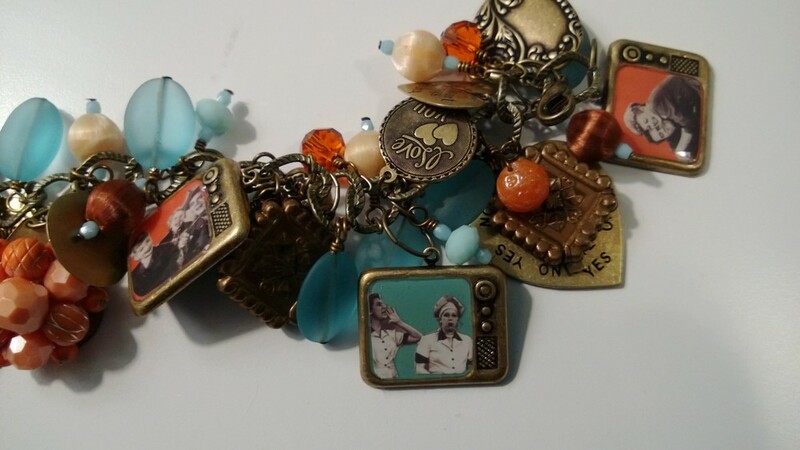 There's so much loot and I want to use it all, so I'm thinking a big chunky charm bracelet will do the trick! Man made beach glass beads, vintage earrings, brass charms, Swarovski rondelles, and little Czech crystals in yummy colors. Next comes finding images and wire wrapping the beads. Resin mixed and time to pour. I love how the poured resin domes over just like the old TV sets. LOL! Oh, and I'll let you in on a little trick I've discovered pouring resin. I always get a drop that spills onto the surface of my wax paper no matter how careful I am. I use this as my "tester" for where the resin is in the drying stage. Better to mess with the little droplet than have a big smudgy fingerprint on all your hard work. Time to cover the pieces, leave them alone and let them cure overnight. Dry and lookin' good! Time to put the pieces and parts together. Ack! I love chunky charm bracelets, but I think I went overboard. Can you have too many charms? One more close up before I start dismantling. I'm liking this version better. 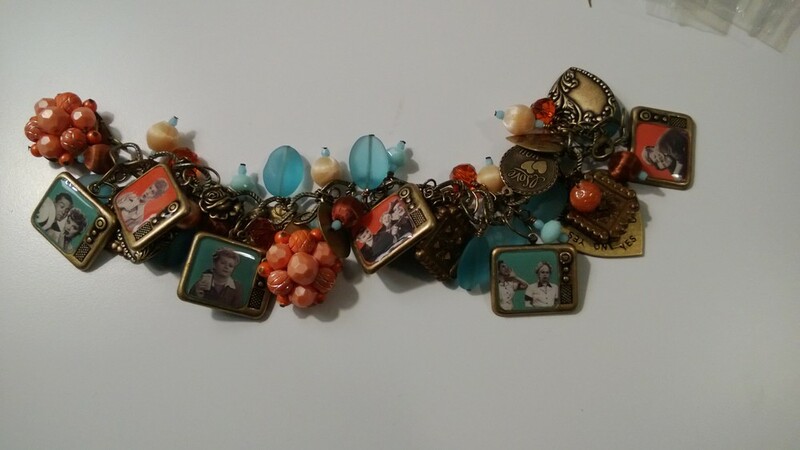 I edited out the blue beach glass beads, and some of the charms, all of the peach and light brown beads. I also decided to put the Lucy charms back to back. Additions include some chocolate ox hearts and dark chocolate beads which makes the orange and blue pop a little more than all that brass. I'm pleased! So there you have it! This was a lot of fun and if you are into jewelry making and haven't done so already, check out B'Sue Boutiques Creative Group on FB. You'll meet our the fabulous Brenda Sue Lansdowne of B'Sue Boutiques and so many talented, nurturing and fun artists who share their creations. Join us! 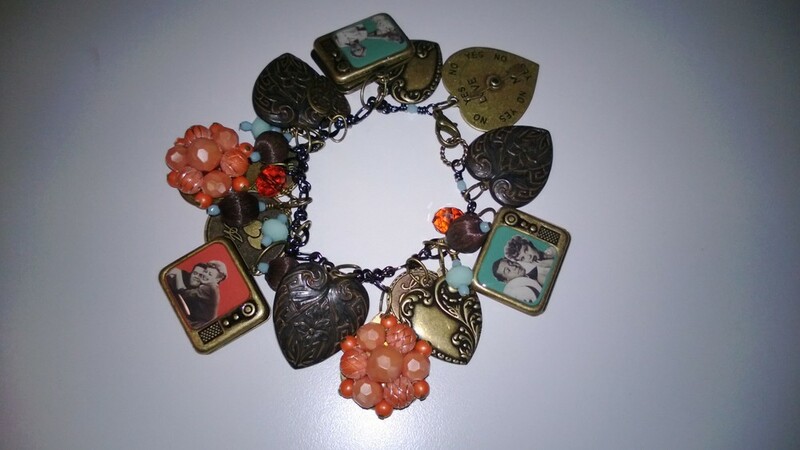 Tagged with charm bracelets, I Love Lucy, Vintage Jewelry, Kitsch, B'Sue Boutiques, Small Stuff Design.